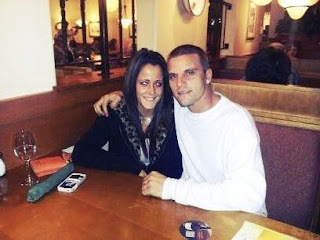 The True Gossip Home / 2, courtland rogers, jenelle evans, married, ring, teen mom, wedding / "Teen Mom 2" Star Jenelle Evans Gets Married...Surprise! "Teen Mom 2" Star Jenelle Evans Gets Married...Surprise! I can hear Jenelle's mom Barbara saying it already, "WELL JAHNELLE, I SEEN YOU'RE MARRIED NOW. GOOD LUCK WITH YOUR LHYFE." "Teen Mom 2" star Jenelle Evans got married in a courthouse today to her fiancé, Courtland Rogers. The two have only been engaged for a few days, according to Jenelle's Instagram page. I'm sure MTV is loving this right now. Jenelle posted the above photo today with the caption, "@courtyb11 took me out to Olive Garden and asked the waiter to take the pic, lmao. Don't ask about my eyes... Weird." Courtland is wearing his wedding ring in the photo. Congrats to the happy couple?